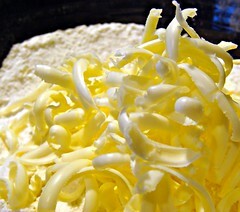 Shred two sticks of unsalted butter on your cheese grater. I do mine on a cutting board, then stick it into the freezer until I need it. Save the wrapper from the butter to use to butter the pan before you put the biscuits on it. It there wasn’t enough butter on the wrapper, I spread bacon grease on the pan with a brush. 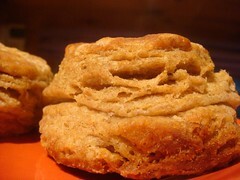 Mix 4 cups whole wheat flour, 1-1/2 teaspoons baking powder, 1 teaspoon baking soda, 1/2 teaspoon salt. Bake for 14 minutes at 450°F. The key seems to be the shredded butter and the fold over. I don’t know why it works, but my biscuits always have a very distinctive middle, it’s the only way I get them to be light and fluffy. Rolling it out thicker gives me hard biscuits every single time, so I just always do the fold over. If I’m cutting them out in shapes, like hearts or whatever, I sometimes just stack two layers, and brush some butter or bacon fat to seal the layers together. I don’t always use whole wheat flour. 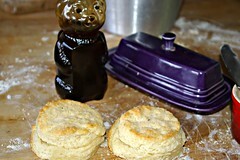 If I want a sweeter biscuit, I’ll add a tablespoon of maple syrup or honey and use a little less buttermilk. Or use heavy cream. Yum. Sometimes I use lard instead of butter, or a combination of both fats. Yummier. We try to eat a tablespoon of our own honey every day to help with our seasonal allergies. This is sure a nice way to get that spoonful in! What a hardship. 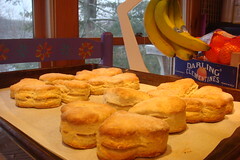 I’ve always called my biscuits “cheater biscuits” because you can always tell I did the fold-over. My biscuits always have that split in the middle. I don’t care, though. It’s the only way it works for me, and I like light and fluffy biscuits. I read all sorts of recipes for biscuits. I try them all, but I make sure to shred whatever fat the recipe calls for on the box grater, and freeze it. And I always roll it out too thin, and double it over. I’m so glad my grandma taught me how to cheat! I actually LOVE the idea of the foldover, this would make them super easy to split. Grating the butter is a great idea – but for some strange reason I LOVE using my pastry blender so I probably won’t ever do it, maybe because my grandma always used a pastry blender when she made biscuits. My mother used to always cut two rounds for each biscuit and stack em. You way makes it a whole lot easier to get the stack effect. And grating the butter is genius. Thanks to your grandmother and thanks for posting your recipe. When you use lard, what do you do? Is it frozen, then grated? I think these look lovely! I made these tonight to go on top of chicken pot pie (easier than pie crust and better at sopping up the gravy). Grating the butter is brilliant — these were the easiest biscuits to put together that I’ve ever made. They rose up beautifully and they taste great! (I had to fake the buttermilk, but they are still terrific). What a great way for your grandmother to improve his information without undermining him in front of you. That’s so cool. I’m also curious about grating lard. What a great recipe! They came out wonderfully. Definately a keeper.